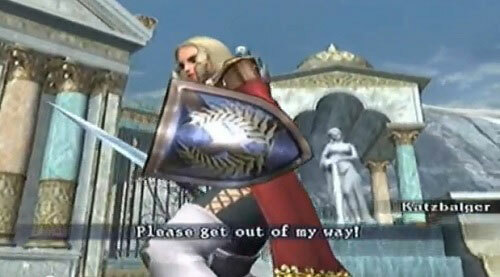 Abelia Schillfelt is an unlockable character from SoulCalibur III on the Playstation 2. 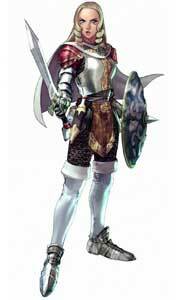 She uses and represents the Sword and Shield skill and is one of the “Chronicles of the Sword” Mode characters. Abelia is not a bad female knight design, but she is also not really interesting, so it is no wonder that Namco never made Abelia a full character with a unique moveset in a SoulCalibur game. She makes appearances in SoulCalibur IV and SC Broken Destiny as a Create A Soul Character though, using Cassandra’s Moves there. Moves from Legend of Zelda’s Link who was a guest character in SCIII on the Nintendo Gamecube were re-used for her fighting style btw. 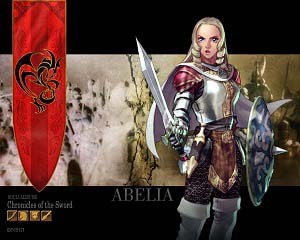 There is not a lot game art available about Abelia to be honest..there is the official illustration of her..the wallpaper with the same illustration and..that’s it. Official Art of Abelia Schillfelt from SCIII, click to enlarge it. Abelia was born in the Grandall Empire, her father was an officer. Abelia joined the Military Academy where she trained under Girardot and was fast respected for her good fighting skills. When a war emerged in the Grandall Empire, she were send to fight alongside the cadet (the player of the Chronicles of the Sword mode) and swears to protect her homeland. Together with the cadet and his whole team, she fights against the Empire of Dalkia. Many years later, when Dalkia was no more, her former teacher Girardot rebelled against the Grandall Empire, and Abelia choose to fight him. 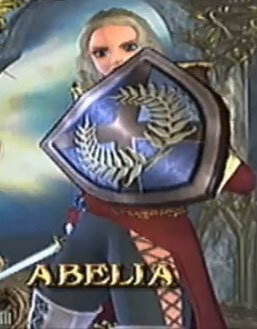 At the end of the game the player has to fight Abelia and defeat her. After her defeat, Abelia finally decided to join the rebellion.